Canvas Draw?�? 3 for Mac is a powerful software specifically designed to make it possible for designers, illustrators, and professionals to advertise and communicate with confidence. Now with a Unicode text engine and user interface, text edit improvements, pressure sensitivity support for drawing tablets and more, Canvas Draw is your best choice for creating and sharing personal, business and marketing content. * The speed of putting large text objects into Edit mode is optimized. * Using the Wand tool on a large image is optimized. * Multiple objects copied on one page can be placed exactly on another page by [shift]+click Paste under the Edit menu. 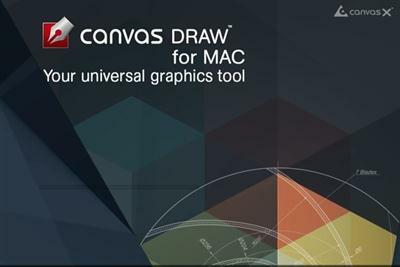 * Canvas Draw 3 will be listed among the recommended software to open PDF files for Open With. * Opening CVX and CVD files is improved. * Fixed the printing of Black and white texture inks. * Fixed Copy & Paste English texts from Canvas Draw 2 to 3. * Fixed borderless printing so that it is supported only when your printer supports it. * Fixed resizing of a rotated vector object to dynamically update width and height values in the Properties bar while dragging the bounding box handle. * Fixed a problem with certain types of Smart Lines getting lost when saving documents as CVDs. * Fixed rotation option in the Replicate dialog box to work correctly for straight lines. * Fixed Canvas Draw 3 to no longer crash even when PopClip App is being turned on. * Fixed crash caused by opening TPL files. * Fixed issue with the background color of CVD documents being correctly recognized upon re-opening. * Fixed issue so that SpriteEffects will continue to be applied correctly to a composite object even after placing the object in Path Edit mode. * Fixed issue so that motion blur applied to a group object will be cleared after ungrouping. * Fixed issue caused by entering a value that results in an image beyond the maximum supported dimensions in the Properties bar. * Fixed issue with long texts in imported RTF files. * Fixed stability issue with importing CVD documents with pattern inks while the Pattern Manager in the Attributes palette is open. * Fixed issue so that a user in Text Edit mode in one layer can work on another layer simultaneously. * Fixed issue so that links with "In a pop-up window (_popup)" as target will be exported correctly to an HTML file. * Fixed issue with the New Mask dialog box appearing when double-clicking on a duplicated text object created by option+drag. * Fixed issue with the Document window shifting to a different position after changing the resolution of the selected image object. * Fixed issue so that correct page numbers are displayed in the Layers To Place dialog box while placing multi-page documents. * Fixed issue so that motion blur can be appended to an object that has other SpriteEffects. * Fixed issue so that pressing the [enter] key in the number pad section will exit Text Edit mode and select the text object. * Fixed issue so that defining an image area with the Paint Object Creator tool or the Camera tool is correctly recognized as Image Edit mode. * Fixed issue so that values typed in the Properties bar will be correctly registered when the metric system is selected for Mac OS X. * Fixed a crash resulting from choosing Edit | Undo after applying the Send to Layers command to a text object on one page to another. * Fixed issue with tile printing. * File | Page Setup is removed. The options in the Page Setup dialog box are combined in the Print dialog. In order to show the page break correctly on a document, you must set a printer and other options, and click the Save and Close button without printing. * To set borderless printing, you need to go into the printer settings in the Print dialog and set the paper. Not all printers support borderless printing even though the paper sizes may be listed. Please check your printer manual to see if your printer supports borderless printing. * When applying another font to texts with UPPERCASE, lowercase, or Title style, the style will be lost. * Document Scale/Drawing Scale can be set to an Illustration document only. * Copy & Paste in RTF will not work from applications, like the Chrome web browser, which does not copy texts in RTF to the clipboard. * PDF - Adobe?� Acrobat?� (Advanced) export will convert texts of Postscript Type 1, Dfonts, and some Japanese fonts to paths even if you select "Embed subset" for the Font embedding. However, it should not be an issue to view or print such PDF files. * When a new blank document is active and you open a supported file, that new document will be replaced by the opening file. When you want to keep a blank new document, create an object first, and then open a file. * JPG files exported with the "Optimize Size" check box selected can be viewed with Safari or Preview on El Capitan (Mac OS X 10.11), not on Mac OS X 10.10 or earlier. * When importing Canvas and Canvas X files, objects that are not supported by Canvas Draw will be represented as rectangles. * AI import only supports AI files that are saved with "Create PDF Compatible File option" selected. * The Date format set for Mac OS X is not respected in the Time column of the Comments & Markup palette. * "Mac App Store and identified developers" must be selected in Security & Privacy options of Mac OS X in order to detect a developer's certificate for Canvas Draw. * Internet access is required to view the online Help. Offline Help is not available. Help files in PDF can be downloaded from the support page. * CNV, CVI, CVX, TPL are not supported for export. * "Preserve Canvas editing capabilities" is removed from the PDF Export Options dialog box. * The warning about opening a PDF file in the PDF Import Options dialog box is removed. * "Make Permanent" check box is removed in Font Match dialog box. Fonts will be always substituted permanently; user should save it as another file name if s/he wants to keep the original document. * Bound text objects do not support text flow from one text object to another. * Pressing [option] + [command] keys to select the previously selected tool in the Toolbox is removed. * EPSF Import Options dialog box is removed. Objects are simply placed in the document. * Soft Hyphen is removed from the Insert Char drop-down menu in the Properties bar and from Edit | Insert. * Text | Style | Bold, Italic, Small Caps are no longer supported. However, when a font has Bold or Italic or both styles, you can still apply by selecting an appropriate font style.